¶ 3 Leave a comment on paragraph 3 0 Tombstone Blues is a very simple blues song at heart. But it’s much more than a typical blues song, and in fact, is one of the better examples of the brilliance that is Bob Dylan. One of the marks of a great artist is that he takes a standard art form and transforms it into something entirely new. Stravinsky did it with classical music. Picasso did it in painting. Bob Dylan did it with the popular song. ¶ 4 Leave a comment on paragraph 4 0 Many artists have written great blues songs, many much more sophisticated than Tombstone Blues, which for most part, consists of two chords played over and over again. Dylan, however, transforms the art form by raising the lyrical sophistication into the realm of literature without losing the essence of the blues. He also modernized the music, adding a rough rock ’n’ roll edge as well as a unique vocal style. ¶ 7 Leave a comment on paragraph 7 0 The verses are something else entirely, wildly inventive and wonderfully obscure. There is a parade of characters: Beethoven, Ma Raney, Jack the Ripper, John the Baptist, just to name a few. I count eighteen proper nouns, which must be some kind of record. Although many of the characters are well-known historical individuals, some of are a bit obscure. A little historical knowledge of these characters might contribute to the readers understanding of the song. ¶ 8 Leave a comment on paragraph 8 0 Belle Star is an interesting character. 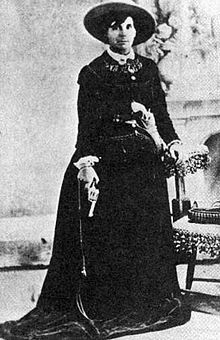 She was the subject of a popular book Bella Starr, the Bandit Queen, or the Female Jesse James, published in 1889 (and still available at Amazon.com today). The book made her out to be a wild outlaw of the American Wild West, robbing banks and shooting guns and so forth. Although Starr did associate with outlaws and may have participated in legal misdeeds (possibly selling stolen horses), there is apparently no hard evidence that she robbed banks or killed anybody. ¶ 9 Leave a comment on paragraph 9 0 Everybody’s familiar with Jack the Ripper, but probably not the details of his sordid existence. Jack the Ripper was the name given to a serial killer (although it was never proven that the deeds were done by a single person) who killed several women in London towards the end of the 19th century. The killer specialized in prostitutes, stabbing them and often mutilating their bodies. ¶ 10 Leave a comment on paragraph 10 0 Several letters were sent to police from people who claimed to be the killer. The web site of the National Archives of the UK says that only one of the letters seems to be legitimate. In this letter the killer included part of the kidney of one of his victims and closed the letter with “From Hell”. The author of one of the letters now believed to be a hoax referred to himself as “Jack the Ripper”, thus the name. The killer was never captured. ¶ 11 Leave a comment on paragraph 11 0 Jezebel – as in “Jezebel the Nun” – is probably a reference to either the Jezebel described in Kings from the Old Testament or the Jezebel in Revelations in the New Testament. More likely from the Old Testament, given Dylan Jewish upbringing and the multitude of Old Testament references is his early work. In both stories Jezebel is portrayed as a very wicked, evil person, and Dylan is certainly being ironic when he refers to her as a nun. ¶ 12 Leave a comment on paragraph 12 1 The story of John the Baptist is complicated and way too long to cover in any depth here. In short, John was a prophet who spoke of the coming of the Son of God, Jesus Christ. He baptized his followers, as well as the baby Jesus. All did not end well for John. He was beheaded by King Herod at the request of the beautiful and seductive Salome, the king’s step-daughter, whose mother was angry with John because he had called her marriage to the king adulterous. ¶ 13 Leave a comment on paragraph 13 0 The “Philistines“ is another biblical allusion. The Philistines occupied the territory around Jerusalem before the arrival of the Israelites. Many bible stories, including those of Samson, Samuel, Saul and David, describe conflicts between the Philistines and Israelites. In the story of Samson, the Philistines kill Samson’s wife and father-in-law. ¶ 14 Leave a comment on paragraph 14 0 Cecil B. DeMille was the first film director to gain considerable fame during his lifetime. DeMille’s career began in the silent era and continued through the 1950s. His most famous movie, The Ten Commandments, starred Yul Brynner and Charlton Heston. Interestingly, he also directed Samson and Delilah, another biblical tale, which may (or may not) account for his appearance in the song. They must’ve been women, ’cause I don’t like no men. ¶ 18 Leave a comment on paragraph 18 0 Gypsy Davey is mentioned, which is a reference the traditional song of that name, often associated with Woody Guthrie. ¶ 19 Leave a comment on paragraph 19 0 Galileo of course is known as the father of modern science. ¶ 20 Leave a comment on paragraph 20 0 Delilah, another biblical reference, betrayed Samson by telling the Philistines that his long hair was the source of his great strength, which of course they promptly cut off. ¶ 21 Leave a comment on paragraph 21 0 There’s a lot of wacky stuff in Tombstone Blues. I’m not sure that some of it makes any sense at all. Why would anybody want to reincarnate Paul Revere’s horse? I can understand maybe Paul Revere himself, but his horse? I suspect he needed a rhyme for “endorse.” The line “The geometry of innocent flesh on the bone”, although it sounds interesting, is meaningless, at least to me. ¶ 22 Leave a comment on paragraph 22 0 I don’t see a great deal of influence of William Burroughs in Dylan’s writing, but I do see it in this song. 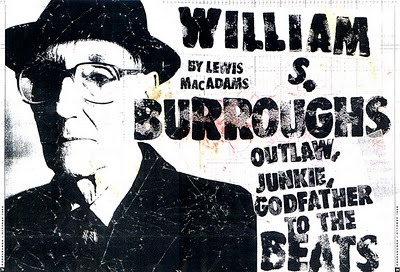 If you randomly open Burroughs most famous work, Naked Lunch, which was banned in the early sixties and for which he was drag to trial on obscenity charges, you will probably see an abundance of characters given very colorful names, just as Dylan does in this song (such as “Brother Bill” and “Commander-in-Chief”). Other Dylan songs from this period draw on this same technique, including Ballad of a Thin Man (“Mr Jones”), Like a Rolling Stone (“Miss Lonely”),Highway 61 Revisited (“Mack the Finger”, “Georgia Sam”), and Just Like Tom Thumb’s Blues (“Saint Annie”, “Sweet Melinda”), and Desolation Row (“Doctor Filth”, “Good Samaritan”). ¶ 23 Leave a comment on paragraph 23 0 Like many Dylan songs from this period, the tone and point of view are very much those of the outsider. The narrator clearly disdains those in power: Politicians (see the lines about the “city fathers”, members of the “chamber of commerce” (note the lack of capitalization), religious figures (“Commander-in-Chief” (and alias for God/Jesus? ), moronic doctors, and corrupt businessmen (working of the “National Bank”). ¶ 24 Leave a comment on paragraph 24 0 Many commentators on rec.music.dylan have pointed out the possibility that the lyrics might contain veiled references to the Vietnam war, which was beginning to ramp up significantly around the time the song was written. An interesting theory suggests that the “king of the Philistines” represents the US president Lyndon Johnson, the “pied pipers” are war protesters and the “slaves” are the innocent soldiers that were being sent into the Vietnam “jungles” to fight. Mike Marqusee, author of Bob Dylan: Chimes of Freedom, believes this song is the closest Dylan comes to making a statement about Vietnam. Although these ideas are interesting, the protest movement against the war did not really begin in any substantial way until 1966, well after the song was written. Of course, Dylan has often been ahead off the pack, so I guess these ideas could have some merit. Or not. ¶ 25 Leave a comment on paragraph 25 0 Dylan plays Tombstone a fairly regular basis. He played it on the MTV Unplugged show. During that performance Dylan sings everything in a carefully controlled voice, a style that doesn’t really fit this song, which works better with a raucous blues shout. ¶ 27 Leave a comment on paragraph 27 0 The soundtrack for the Scorsese film No Direction Home contains an alternative take. Instead of “John the Baptist” Dylan sings “John the Blacksmith” and he changes “Daddy’s in the kitchen looking for the fuse” to looking for “the food”. Some background vocals are added to the chorus and the song ends prematurely as Dylan breaks out in laughter. ¶ 29 Leave a comment on paragraph 29 0 The booklet included with No Direction Home mentions that an unreleased version contains background vocals by, of all things, the staid folk group The Chamber Brothers. ¶ 30 Leave a comment on paragraph 30 0 A decent version appears on the 1984’s Real Live , although it doesn’t top the original.